(Plainfield, IN 2/11/14) Last Thursday, Islamic Society of North America (ISNA) Director of Chaplaincy Services and Islamic Endorser Chaplain Abdul-Rasheed Muhammad met with the Clinical Pastoral Education (CPE) Supervisor Reverend James Pfeiffer and six CPE students from St. Vincent Hospital at ISNA Headquarters. 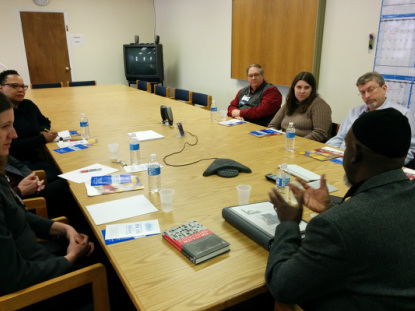 The meeting provided several potential avenues for collaboration in the areas of multi-faith cooperation and dialogue, continuing education opportunities and the possibility of a future Clinical Pastoral Education Program at ISNA Headquarters. There was also an interest in setting up a point of contact with ISNA in terms of Pastoral Care Services and issues of Death and Dying according to the Islamic faith.